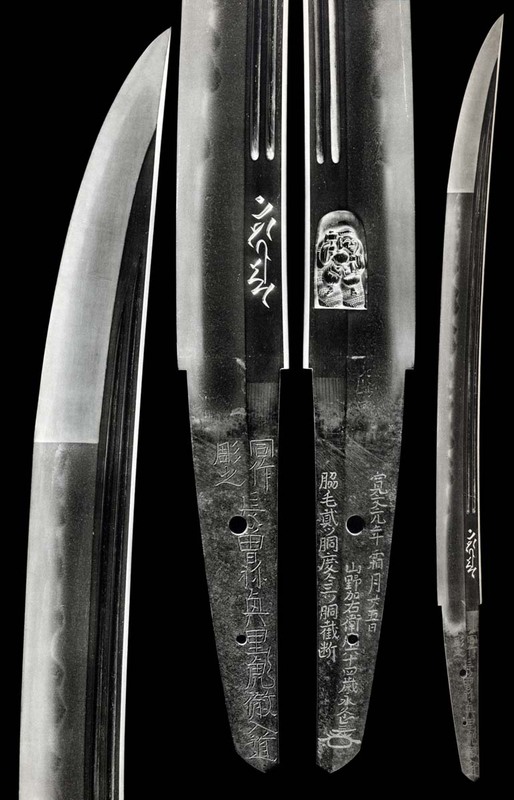 Blades �are KO-MOKU with MASAME in the SHINOGI. the KOTETSU's teacher must have been Kazusa-no-Kami Kaneshige's father, IZUMI-no-KAMI. 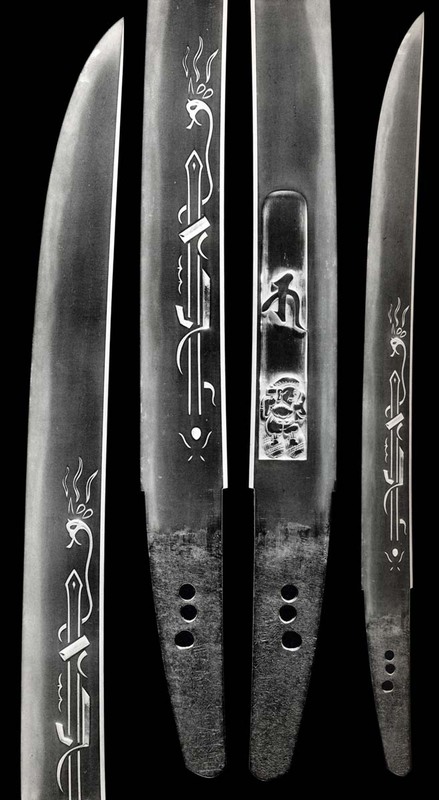 Shinogi-Tsukuri, Ihori-Mune, wide blade shallow Sori and O-Kissaki. Nie Gunome-Midare with Sunagashi and Kinsuji.Yakidashi. Kanmuri Otoshi in the upper, Hira-tsukuri in lower. 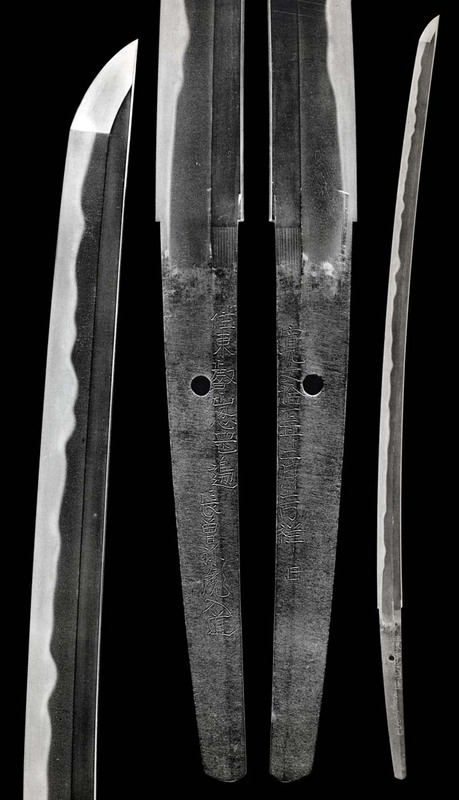 Mitsu-Mune, wide blade to O-Kissaki. Ko-Itame Hada with running Masame has Ji-Nie. O-Hada in the mid. Upper: Gunome-Midare Ba and Cat's Paw Togari in Nioi-Fukashi and Ara-Nie with running Sunagashi and Kinsuji. Lower: Asaki-Notare and streaming Sunagashi. Midare-Komi Saagari Boshi to Ko-Maru Omote and Togari Ura with Hakikake. Ubu Katasogi Nakago with one Mekugi-ana. Ko-Itame Hada with Ko-Masame in the Shinogi-Ji. Thin veil of Ji-Nie. Chu-Sugu Asaki-Notare with Juzuba "String of Beads" Gunome with Ko-Ashi in tight Nioi and Ko-Nie. Ubu Haagari Kurijiri Nakago with rounded Saki and one Mekugi-ana. Hira-Tsukuri, Mitsu-Mune, wide, with slight Sori. Omote: Kurikara and Rendai Suken. Asaki-Notare Gunome mix with Sunagashi and Kinsuji in Nioi and Nie. 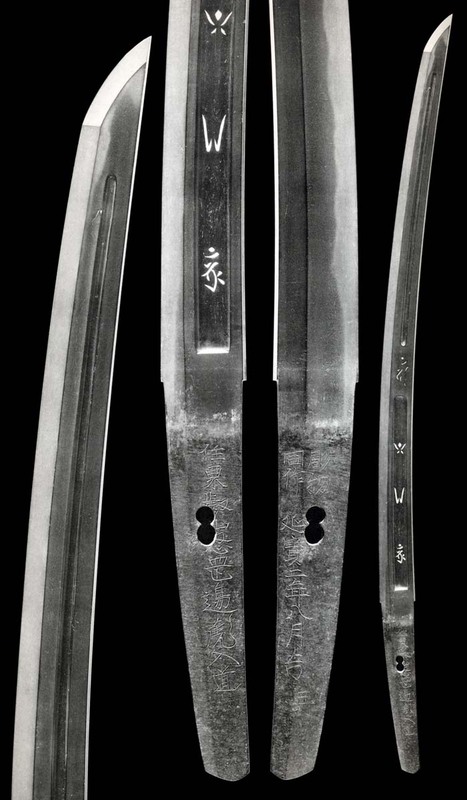 Shinogi-Tsukuri, Ihori-Mune, wide, with slight Sori. Running Ko-Itame Hada has Ji-Nie. Notare of Gunome forming his "Gorde" pattern. Sunagashi and Kinsuji in Nioi and Nie. Ko-Itame Hada with thin veil of Ji-Nie and Chikei. Masame in the Shinogi-Ji. 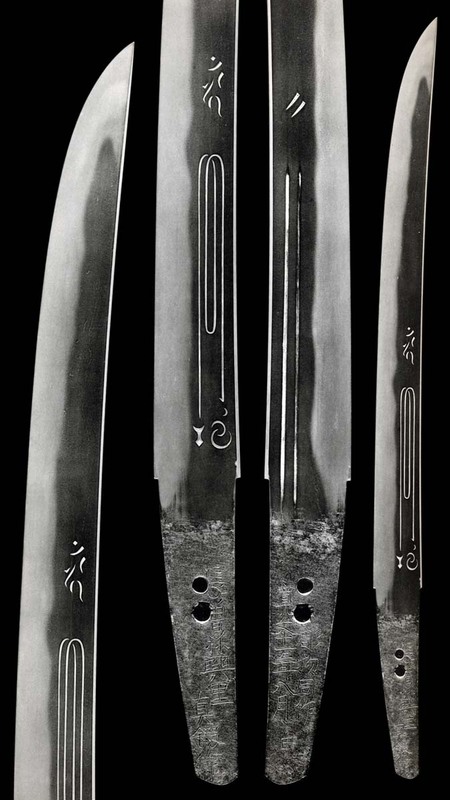 Notare Hamon of Gunome-Midare with deep Ashi in Nie and clear and shining Nioi. Sunagashi brushes Hotsure in tops. Hira-Tsukuri, Mitsu-Mune, wide with shallow curve. Omote: Bonji and Fudo's Rope. Tightly knit Ko-Itame Hada that runs. Ji-Nie. A wide Notare has Gunome-Midare Ba in Nioi-Fukashi and Ko-Nie. Sunagashi runs through. Shinogi-Tsukuri, Maru-Mune, deeply curved to Chu-Kissaki. Ko-Itame Hada has thin veil of Ji-Nie. masame in the Shinogi-Ji. Hiro-width has long Asaki-Notare line has Juzuba "String of Beads" Gunome-Midare Ba with Ashi. Nioi-Fukashi and Ko-Nie with many instances of Kinsuji. Kurijiri, Ubu Nakago has one Mekugi-ana. 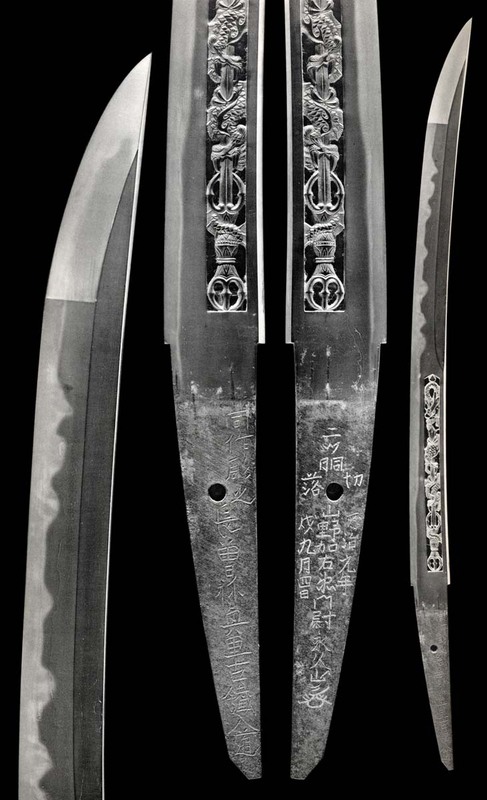 Omote is Katakiriba-Tsukuri, Ura, Shinogi-Tsukuri, Ihori-Mune, wide blade, deep curve and strong, elongated Chu-Kissaki. Omote has Bo-Hi in the upper. A Bonji in the mid, and a framed Rendai, Kuwagata and Bonji. Tightly knit Ko-Itame Hada has Masame in the ShinogiJi. There is a thin veil of Ji-Nie. Ko-Notare Gunome-Midare mix with Ko-Ashi and running Sunagashi. Ko-Maru Boshi with medium Kaeri. Ubu Kurijiri Nakago has two, joined Mekugi-ana.